We’d love your help. 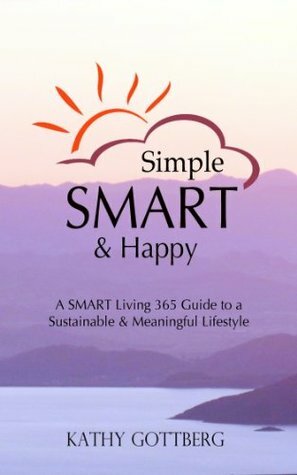 Let us know what’s wrong with this preview of Simple * SMART & Happy by Kathy Gottberg. Ever feel overwhelmed by all the “stuff” in your life? Ever wonder if your life would be happier if things were more simple? Research now shows that when a person steps back from a busy and complicated life they learn that a simple, more minimal approach offers everything they need to live a joyful and meaningful life. Simple * SMART * Happy is a collection of posts writte Ever feel overwhelmed by all the “stuff” in your life? Ever wonder if your life would be happier if things were more simple? Research now shows that when a person steps back from a busy and complicated life they learn that a simple, more minimal approach offers everything they need to live a joyful and meaningful life. Simple * SMART * Happy is a collection of posts written by Kathy Gottberg on her blog SMART Living 365.com. These articles address some of her best ideas about the topic, and tie into how each of us can discover our own version of “simple” in order to experience a more fulfilled and rewarding life. To ask other readers questions about Simple * SMART & Happy, please sign up.